Ms. Shad Begum is founding director of the Association for Behavior and Knowledge Transformation (ABKT), an organization working toward the economic and political empowerment of communities in underserved areas of Pakistan. Under her leadership, ABKT has mobilized scores of community-based organizations to engage with the government and has trained thousands of women in different skills and trades. Ms. Begum previously worked with the UN Human Settlements Program as a consultant for the “Building Gender Ladder Project,” as well as with UNDP’s Women Political Participation Program. She contested local elections in 2001 as an independent candidate and served as councilor for five years in Dir Lower. She is an Ashoka Lifetime Fellow and the recipient of numerous awards, including the U.S. Department of State’s “International Woman of Courage Award” (2012) and the “Prize for Creativity in Rural Life,” awarded by the Women’s World Summit Foundation (2008). 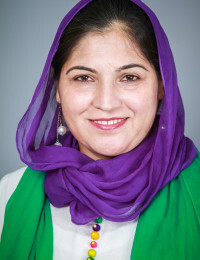 During her fellowship, Ms. Begum is laying the groundwork for the establishment of a Center for Women’s Democratic Development in northwest Pakistan. “Women, Religion, and Peace,” Council on Foreign Relations, October 29, 2015. “Karamah receives Pakistani Activist and NED Fellow Ms. Shad Begum,” Karamah: Muslim Women Lawyers for Human Rights, November 11, 2015. “3 Ways Smart Business Women Get and Stay Inspired,” HuffPost Women, January 19, 2016. “Women’s Resilience and Resolve in Northwest Pakistan: Championing Change in the Face of Extremism,” National Endowment for Democracy, December 9, 2015. “Women and Girls Rising: Progress and Resistance Around the World,” Woodrow Wilson Center, February 25, 2016.